From musician, writer and performer to producer, mix engineer and record label owner, Ethan Johns has honed his craft as a guitarist on both sides of the control room glass. Ethan Johns’ productions are synonymous with a host of world-class studio albums from a profusion of artists such as Paul McCartney, Tom Jones, Laura Marling, Paulo Nutini, Ryan Adams and Kings Of Leon. His characteristically organic hyperrealism in recorded sound is a sonic signature that pays testament to a pure, lifelong love of music, not only as an award-winning producer, but also as a notable multi-instrumentalist and creative artist. How did you venture into the recording environment of music? Do you prefer a more experimental approach to recording? 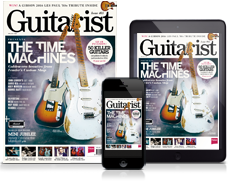 So would you identify as a guitarist first and foremost? “Yeah, guitarist/drummer. The first production gigs that I got were from songwriting sessions. I’d play guitar, write songs with other people and make a demo. And then some A&R guy would hear the demo and say, ‘That sounds good - who recorded that?’ and then - boom! What acoustic guitars are really important to you right now? I’ve got a 1969 Martin D-18... I picked that thing off the stand, played one chord and went, ‘How much do you want for it?! “I’ve got a 1969 Martin D-18, which is really nice. That’s the one I recorded the most with on my last solo album [Silver Liner, Ethan Johns With The Black Eyed Dogs]. It’s really beat - proper thrashed. It’s an important guitar to me. I’d just moved out to LA and I had no acoustic guitar, but I had just gotten off the road with Crosby, Stills & Nash, so I had a few quid in my pocket and I picked that thing off the stand, played one chord and went, ‘How much do you want for it? !’ Instant connection. It’s been my main recording acoustic ever since. “I take my 2000 Martin D-41 around with me a lot now - I’ve been using that one live for the last three years - and then there’s a 1964 Gibson Custom J-200 that is an amazing rhythm guitar. My [Gibson J-180] Everly Brothers guitar is also a good rhythm guitar, especially for the faster, higher rhythm playing. What electric guitars do you favour? “I’ve got a ’52 Telecaster, which I still play a lot. It’s a great guitar, but one of my main electric guitars, which I used when I MD’d the UK Americana Awards, is a modified 2006 Mexican Fender Telecaster. It’s really my number one. It’s nothing to write home about in terms of vintage appeal, but the whole point of this guitar was for it to be as versatile as possible and it’s got everything I want in a guitar. It may not have the vintage kudos of some of the other guitars in his collection, but Ethan’s Mexican Tele wins points for versatility: “It’s got everything I want,” he says. The B-Bender system in Ethan’s Mexican Tele was personally installed by The Byrds’ Gene Parsons, inventor of the B-Bender! What advice would you give to guitar players when it comes to playing and writing their own material? “Keep asking questions and try to do the best you can. People sometimes dismiss all kinds of music other than the stuff they’re listening to. I’m not saying that you shouldn’t champion the thing you love, but the truly great guitar players that I’ve come across are learning from every corner that they possibly can. How do you perform and ensure you capture a great take? “I think one of the reasons that some recordings are still considered to be classic and sound fresh today is because they’re personal expressions of the artists. If you put on those Beatles records, the first thing that you hear is the personality of the people making the records, because there were so many imperfections. What is the best way for guitarists to approach writing and recording? What moments particularly stand out in your life as a musician? 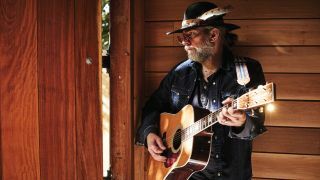 “One of my highlights would be playing a benefit concert for Fred Walecki [of Westwood Music, Los Angeles] with Ry Cooder. I also got to play with The Byrds that night. What a buzz! It was the first time those guys had played together in a long time, and there I am playing drums with them - it was incredible! “The most important thing for me about those experiences was the joy in the music. It was a buzz to play with Ry in rehearsal, but when we walked on stage, that was when he really unleashed. It was like a lightning bolt! I’ve never been so lit up by another musician in my entire life. I’d never felt energy like it before. It was like he was from another planet. “I’m recording with Ida Mae at the moment and it’s been fantastic. The songs are great! I’m loving working with those guys. Stephanie [Jean] is a phenomenal keyboard player and it’s great to play drums alongside [guitarist] Chris Turpin. I find I relate to them as artists as much as anything. Do you like to play guitar every day?